On occasion, the Church of Scientology has received well-scripted official support. When the Church of Scientology held a splashy grand opening in Buffalo in November 2003, local Scientologists urged Mayor Anthony M. Masiello to declare "Church of Scientology of Buffalo Day." What's more, the Scientologists wrote a speech for the mayor. In Buffalo and around the world, Scientology seeks legitimacy to counter allegations that it's a cult. And local lawmakers and other officials have been happy to oblige. Consider that when the church's Volunteer Minister Corps appeared at the Erie County Fair last summer, County Legislature Chairman George A. Holt Jr. issued a proclamation praising their work. "Scientology is a very positive, productive Christian group in the community," Holt explained later. Scientology, however, is not a Christian religion, nor, as the name could imply, is it connected in any way to the Church of Christ, Scientist. Holt also approved an anti-psychiatry display that was set up Jan. 24 on the ground floor of Old County Hall by a Scientology-linked group before Administrative Judge Sharon S. Townsend requested it be taken down to avoid influencing jurors. And when Scientologists wanted to bring a controversial prison-based drug treatment program to Buffalo, a church patron paid to send two Erie County Holding Center officials to Mexico to observe it in action. Superintendent H. McCarthy Gipson subsequently sought to introduce the Second Chance Program into the county jail at a potential taxpayer cost of $700,000. A budget shortfall put the project on hold. Critics - including former members - contend Scientology is a predatory cult that threatens families and communities. And, they say, Buffalo could be ripe for the plucking. "If I were a citizen of Buffalo, I'd want to take a very, very hard look at this group in light of its worldwide reputation," said Cynthia Kisser, former executive director of the Cult Awareness Network in Chicago. "There's an agenda beneath the surface that may not bode well for the community at large." That view was shared by Stephen Kent, a sociologist at the University of Alberta, Canada, who has written extensively about Scientology and had praise for the network's efforts at monitoring potentially harmful groups. "The Scientologists' strategy is to use officials in its legitimization efforts," Kent said. "One wonders how much Buffalo officials knew about the organization they were endorsing." The church maintains it is the victim of religious bigotry - and accuses the original Cult Awareness Network, which Kisser was a part of, of being a "hate group." "Like all new ideas, Scientology has come under attack by the uninformed and those who feel that their vested interests are threatened," said Teresa Reger, president of the Church of Scientology of Buffalo. Beth Akiyama, a Scientologist spokeswoman, said it meant a lot to the church to have the mayor's support. "We share the mayor's vision for this city and are working hard to achieve it," Akiyama said. The Church of Scientology has been in Buffalo since 1967 and has pursued new members and symbols of acceptance from local governments. But a little over a year ago, things changed. The Buffalo church became Scientology's regional hub for parts of Ohio, Pennsylvania and southern Canada, as well as for Central and Western New York. Coinciding with that has been an increase in community acceptance and recruitment efforts in Western New York, including a Scientology-related "Dianetics" recruiting booth in Walden Galleria. Scientology's higher profile here coincides with the much-praised $2 million-plus renovation of a four-story terra-cotta building at Main and Virginia streets. The church purchased the building for about $400,000. 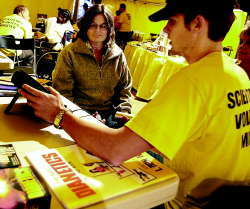 About 1,400 people - many from out of state - braved a chilly, gray day in November 2003 for Scientology's grand opening outside the new building. The church has successfully cultivated Hollywood stars, and this slickly produced event on Main Street was cast with Hollywood actress Jenna Elfman, along with local rock star Billy Sheehan, top church official David Miscavige and Masiello. The set featured a red-carpeted stage and a TelePrompTer, virtually unheard of at Buffalo events. Signifying the city's embrace of Scientology, founder L. Ron Hubbard's booklet "The Way to Happiness" was distributed with a picture of City Hall on the front cover and - with the permission of the Masiello administration - the city seal on the back. Miscavige, Hubbard's successor, spoke in a rare public appearance. Then the mayor sent the crowd into a frenzy by praising Scientology and its potential in Buffalo. "Take the Church of Scientology of Buffalo to and beyond Saint Hill size!" exhorted Masiello, repeating a Scientology rallying cry that refers to the church's rapid growth in England's Saint Hill Manor during the mid-1960s. Getting the mayor to praise Scientology was a public relations coup for the church. How did the mayor know so much about Scientology? "They had everything on a TelePrompTer," Masiello admitted later. "I basically edited it and used what they gave me. I read it several times, and if I felt it was objectionable, I wouldn't have done it." The mayor said the church wrote the proclamation, too, noting he lacks the staff to write the many proclamation requests he receives. Masiello said he was unaware of controversies that have swirled around Scientology for decades. But if he had been, it wouldn't have mattered: He was grateful to the church for investing in a blighted block and for doing an excellent job restoring a long-neglected building. The church has also been involved in local cleanup efforts. "My zest and enthusiasm was for what they were doing on that corner," Masiello said. Last year, the mayor issued another Scientology proclamation at the church's request, declaring March 13 "L. Ron Hubbard Day." Former Illinois Gov. Jim Edgar issued a similar proclamation in the early 1990s but later rescinded it to distance himself from Scientology's controversial founder. The mayor wasn't alone in having his words written by the church at the grand opening. Scientologists helped write Ellicott Council Member Brian Davis' speech. "All great religions have a mission to help their followers," Davis told the gathering, "yet from what I've seen of your new church, you have taken it to a new level." Davis praised a Scientology-linked drug-treatment program, although its educational component has been banned in San Francisco and is now under investigation by California's state Department of Education. Its detoxification methods are similar to the program being promoted for the Erie County jail. Davis later admitted his knowledge of Scientology came mostly from brochures and videos the church supplied to him. How much impact Scientology will have in Buffalo remains to be seen. But a look at a community where Scientology has taken root shows what can happen. Clearwater, Fla., was financially depressed - much like Buffalo - when the church began buying property there under another name 30 years ago. Today, Clearwater is well on its way to becoming a Scientology town, much as Salt Lake City is home to the Mormon Church. But the church's relationship with local government officials, the local newspapers and many residents has often times been hostile. The St. Petersburg Times accused the organization of being a cult that threatened the community. Gary Weber, who worked in public relations and legal affairs for the church, told The Buffalo News that he helped plan smear campaigns to discredit public officials and a newspaper reporter. "Hubbard instructed us to attack and never defend," said Weber, who left the church 20 years ago and today works as an aircraft inspector in Ontario, Calif. "Anybody who attacks saving mankind - which is what we were told we were doing - should be destroyed. They want to be the bully because that way no one will stand up." Akiyama, the church spokeswoman, declined to say whether the church had engaged in a smear campaign. "It's a hackneyed, trite old story," she said. But Akiyama said the church has for some time enjoyed excellent relations with the Clearwater city government and noted that current Mayor Frank Hibbard spoke recently at a church celebration. The one constant in Scientology's presence in Clearwater has been growth. The church has become the Gulf Coast city's largest property owner downtown, as the city's population has increased by 25,000 since 1980 to 110,000. The church will soon open a $50 million building on a full city block and recently broke ground on a 15-story condominium. It also plans to build a $40 million auditorium. That will add to the 21 buildings and a dozen vacant lots the church already owns. Last year, it paid taxes of $605,000 on property not used for religious purposes, such as restaurants and hotel rooms. Nearly 7,000 Scientology followers live downtown, including 1,400 members of the church's elite Sea Organization who earned $75 a week, along with food, lodging and benefits in 2004, according to the St. Petersburg Times. In Clearwater and elsewhere, the church promotes a drug detoxification program it calls the Purification Rundown. For some members, it's their first contact with the church. The program - the same one operated in the basement of the Buffalo church - involves ingesting large quantities of niacin and other vitamins; calcium with magnesium and other minerals; and cooking oil. It also promotes sauna treatments to sweat out residues and exercise to stimulate circulation. Hubbard believed that drug users retained pictures of past drug experiences that held people back and that the body stored drugs, as well as toxins, in the body's tissues. His Purification Rundown was developed, he said, to clear the body and the mind of drugs. The Hubbard-based program - which can cost thousands of dollars - is considered a religious rite. But a form of it is made available - for "secular purposes," the church maintains - and licensed under the names Narconon and Crimonon, the latter for use in prisons. Hubbard's scientific theories and methodologies have drawn criticism from addiction specialists. Former Surgeon General C. Everett Koop criticized Hubbard's drug-treatment theories following the publication of a book touting them. "My recommendation about detoxification is to keep away from it," Koop warned. "I don't think L. Ron Hubbard has credibility in the scientific world." He apparently does with Erie County prison officials. Scientology was first publicly linked to the Erie County Sheriff's Department in March 2003. Then, a crew of six inmates from the Erie County Correctional Facility in Alden spent a month working on renovations at the new church at the recommendation of church patron Joseph Sgroi. Sheriff Patrick M. Gallivan ordered a halt after an article in The News revealed their use. Before that, in October 2001, Sgroi paid for Erie County Holding Center Superintendent Gipson and now-retired Deputy Superintendent Robert Huggins to observe Second Chance at work in two Mexican prisons. Gipson came back to Buffalo impressed. "I've been trying to get a jail-based drug treatment program basically since I started in 1998," Gipson said. "Still, I went there with a very negative attitude. I was going to be the hard guy. But I came away a believer." "I saw some very hard-core drug users in the Tijuana jail, and these guys said it had changed their lives and that they no longer desired or wanted to use drugs," Gipson said. "I was moved almost to the point of wanting to shed tears." The jail's drug treatment plan was shelved after budget constraints forced funds to be diverted, the superintendent said. Gipson, who is not a Scientologist, said he plans to continue working with Scientology's local leaders to bring the drug treatment program to Buffalo. 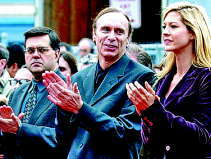 Council President David A. Franczyk, left, Buffalo-born rock musician Billy Sheehan and actress Jenna Elfman were on hand for the 2003 Church of Scientology opening here. The Church of Scientology offers health services at a number of local venues, including this one last summer at the Erie County Fair, where Jason Adams gave Betsy Vik of Ashville a stress test at the Scientology tent.